Lygus bug (Lygus hesperus Knight and other closely related Lygus species) feeding results in economic damage on many crops grown in the Pacific Northwest (Table 1, column 1). Growers of Lygus-susceptible crops have historically turned to expensive and biologically disruptive insecticides to keep populations of Lygus below the economic thresholds. In a number of cropping systems, insecticide resistance has become a problem (Xhu and Brindley 1992) Therefore, alternative control measures are being investigated to establish less disruptive methods for controlling Lygus bugs. One alternative control measure being studied is conservation biological control using parasitic wasps in the genus Peristenus. Lygus bugs attack a broad range of host plants in the Pacific Northwest including alfalfa, fruits, vegetables, seed crops, and numerous weedy plant species (Scott 1987, Table 1). They feed by first injecting their piercing-sucking mouthparts into plant tissues followed by injecting digestive enzymes. Damage mimics that of chemical injury. Lygus can also reduce seed production on crops being grown for seed indirectly by stressing plants and directly by damaging seed pods (Day 1997). 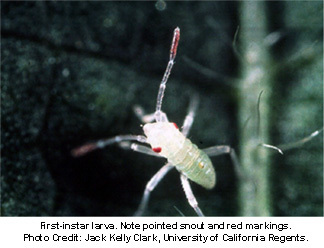 Nymph-state Lygus are the main pest in many crops, but adults seem to be the culprit in tree fruit damage, as nymphs are seldom observed in fruit trees. Soon after adults become active in the spring, they begin feeding upon the tender tips of emerging vegetation (UC IPM online 2002). Lygus bugs will typically fly to alternate crop hosts after the dry-down of spring weed hosts. In the case of tree fruits, a similar phenomenon occurs during the summer season; when preferred host plants like alfalfa are harvested, adult Lygus may migrate into tree fruit orchards. Damage to tree fruits is typically characterized by “catfacing” of fruits when they are fed upon while still green. When near-ripe fruits are fed upon, necrotic spots are noticeable on the fruit. Economic damage to fruit such as apples occurs at low densities of Lygus because apple prices are based largely on cosmetic appearance. Lygus hesperus is native to the western United States and is the predominant Lygus pest species in the region (Kelton 1975). Adult L. hesperus are greenish-brown, oval-shaped insects about 6 mm long and somewhat flat. Immature forms are usually pale green or brown with later-stage nymphs exhibiting five distinct black spots on the abdomen. Nymphs resemble adult aphids in shape and size, but move more quickly and lack cornicles (hornlike structures). L. hesperus overwinter as adults in the crown of short plants or in ground debris. Overwintering males are mahogany in color, while females take on a reddish hue (UC IPM online 2002). Adults become active in the early spring. 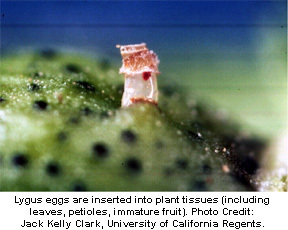 After mating, females oviposit their curved eggs into the tissue of leaf midribs and stems of host plants (Day 1996). L. hesperus can produce up to six generations of offspring per year, but generally they complete only three generations per year in the Pacific Northwest. Peristenus diogneutis is a brown parasitic wasp about 3 mm long (Day 1997). A native parasitoid of Lygus rugulipennis in northern Europe, P. diogneutis only attacks plant-pest leaf bugs such as Lygus. They most frequently occur in alfalfa fields where they overwinter as pupae in cocoons, emerging in June (Day 1997). In the United States, P. diogneutis can produce up to three generations of offspring per year, at about the same time as the major generations of Lygus spp. (Day 1997). 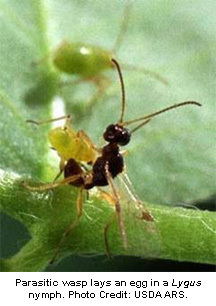 After mating, a female wasp will use her ovipositor to inject a small egg into a Lygus nymph. Once the egg is deposited in a host, it will emerge as a larva in 5 to 7 days (Day 1997). The newly emerged wasp larvae will feed on the internal tissue of the dying Lygus for 7 to 10 days at which time it pupates and drops to the soil below (Day 1996). Peristenus howardi Shaw is a recently described species believed to be native to the Pacific Northwest. In Idaho, where it was originally discovered, P. howardi, like P. diogneutis, produces three generations of offspring per year (Day et al. 1999). P. howardi is a small black wasp about 2.5 mm in length with a large proportion of recorded adults being females (Ball et al. 2001). The reproductive biology and life stages of P. howardi are believed to be similar to that of P. diogneutis, though more studies are required. The parasitic action of Peristenus spp. on Lygus is well accepted and documented. The question is whether this activity reduces or could reduce Lygus populations sufficiently to avoid economic damage on the affected crops. Intentional releases of P. diogneutis took place in the eastern United States as early as 1979, where they were shown to reduce some Lygus spp. populations to varying degrees (Coulson 1987). Surveys conducted in Idaho in 1997 and 1998 reported parasitism rates as high as 81% by P. howardi on L. hesperus nymphs in alfalfa grown for seed (Day et al. 1999). Such high percentages naturally led researchers to speculate on the practical application of the parasitic wasp as a biocontrol agent. Further work in Idaho in 1999 showed rates as high as 75% (Colgrove and Bitner 1999). Based on available research evidence, intentional releases of Peristenus spp. took place in California in 1998, 1999, and 2000. While results of these releases were not available to us at this writing, results from a 2000 survey of Lygus parasitism by Peristenus spp. in Idaho and Nevada were less-than-promising. About ten percent of the Lygus nymphs collected in Idaho and none of those collected in Nevada showed evidence of parasitism (Ball et al. 2001). While a reduction of Lygus by ten percent is a step in the right direction and may even keep the pest population below the economic threshold for some crops, it is insufficient to protect crops in which cosmetic appearance is highly prized, such as apples and strawberries. So what might the incidence of parasitism of Lygus by Peristenus spp. be in other parts of the West? In 2002 and 2003, we set out to determine this in a number of locations where this relationship had not been previously documented. We surveyed over 100 sites, primarily in eastern Washington, but also in northern Oregon, western Idaho, and central California (the latter by Dr. Frank Zalom’s staff at the University of California, Davis). Lygus nymphs were captured from crop and weed hosts with sweep nets, then aspirated into vials, placed on ice, and transported to a freezer at Washington State University’s Irrigated Agriculture Research and Extension Center (WSU-IAREC) in Prosser. Lygus from California were captured by Dr. Frank Zalom’s staff, killed by freezing and air shipped to Prosser for dissection. Laboratory assistants at WSU-IAREC dissected over 9500 Lygus nymphs to determine and quantify the presence of Peristenus wasp parasitoids. Over the two-year period of our field surveys, we examined Lygus from 105 sites. Only three of our sites showed an incidence of parasitism exceeding 10%. One site surveyed in 2002 showed a parasitism rate of 32%, the highest by far among our survey sites. This was a mustard field near Touchet, Washington. Not surprisingly, growers in the Touchet area are aware of the parasitic wasp affecting Lygus bug, and have been actively conserving Peristenus spp. by altering their production and pest management strategies to promote the survivorship of the wasp. This has been accomplished by providing refugia (areas that are not sprayed with insecticide) and by adopting cultural practices that limit the disturbance of soils. Peristenus spp. pupate in the soil. We found that parasitism was higher in the less-disturbed areas surveyed. The wasp seems to prefer undisturbed areas, whereas the pest is well adapted to highly disturbed, cultivated croplands. The overall rates of parasitism were lower in our 2003 surveys than in 2002, but 2003 seemed to be a particularly favorable year for Lygus populations. This is likely attributable to the rain pattern in 2003. Increased abundance of Lygus bugs would tend to dilute the rate of parasitism as a percentage of the population. The results of our surveys indicate that control of Lygus populations with Peristenus spp. below economic level may be difficult to achieve in most agricultural systems in the Pacific Northwest. Adding to the difficulty of augmentative biocontrol application, rearing Peristenus wasps is quite difficult and no commercial sources are available at this time. A final factor limiting the utility of a Peristenus spp. complex to control Lygus populations is the slow rate of control. After being parasitized, Lygus nymphs continue feeding until the 5th instar, at which point the wasp parasite increases its growth rate and kills the nymph. For crops in which the nymph-stage Lygus causes damage, a considerable amount of harm can be sustained during this interval. While Lygus are well acclimated to a broad range of host plants in highly disturbed areas, our study indicates that Peristenus spp. only make an impact as a biological control agent in non-disturbed areas. Our initial surveys in Touchet, Washington, in addition to data collected by Day et al. in Idaho in the late 1990s support the concept that stable undisturbed environments potentially permit populations of beneficial predators and parasitoids to increase. We feel that in most agro-ecosystems of the Pacific Northwest where there are few undisturbed areas of refugia Peristenus spp. will likely have little or no impact on populations of Lygus. At this time most agro-ecosystems of the Pacific Northwest do not appear to be well suited for populations of Peristenus spp. to build to densities that will provide biological control of Lygus below economic thresholds. We are currently investigating cover crops in the tree fruit agro-ecosystem that may augment the survivorship of Peristenus spp. and consequently increase parasitism rates of Lygus. The creation of such refugia in or near agricultural commodities that host populations of beneficial arthropods such as Peristenus spp. could be instrumental in improving Integrated Pest Management (IPM) strategies that would help reduce commercial reliance on disruptive insecticides. Tim Waters, Doug Walsh, and Holly Ferguson are based at Washington State University's Irrigated Agriculture Research and Extension Center (IAREC) in Prosser. They can be reached through the IAREC switchboard at (509) 786-2226 or, respectively, at twaters@wsu.edu, dwalsh@wsu.edu, or hferguson@wsu.edu. Ball, J. C., C. H. Pickett, C. C. R. Baird, and J. Knight. 2001. Search for Native Parasitoids of Lygus hesperus in Idaho and Nevada. In Biological Control Program Annual Summary, 2000, Dale M. Woods, Ed. California Department of Food and Agriculture, Plant Health and Pest Prevention Services, Sacramento, California. 78 pp. http://www.cdfa.ca.gov/phpps/ipc/biocontrol/annuals/2000annual/2000annual.pdf. Colgrove, E. and R. Bitner. 1999. Idaho Lygus Parasites: Lygus Parasitoid Progress Report for Summer 1999. International Pollination Systems. http://www.pollination.com/PublicationsResearch/idaholygusparasites.htm. Coulson, J. R. 1987. Studies on the biological control of plant bugs (Heteroptera: Miridae): an introduction history, 1961-1983, pp. 1-12. In Economic importance and biological control of Lygus and Adelphocorus in North America, R.C. Hedlund and H. M. Graham. U. S. Department of Agriculture, Agricultural Research Service 64. National Technical Bulletin, Springfield, VA.
Day, W. R. 1997. Imported wasps work well as biological controls. USDA-ARS. http://www.ars.usda.gov/is/AR/archive/dec97/wasp1297.htm. Day, W. 1996. Evaluation of the biological control of the tarnished plant bug (Heteroptera: Miridae) in alfalfa by the introduction of Peristenus diogneutis (Hymenoptera: Braconidae). Environmental Entomology, 25: 512-518. Day, W., C. Baird, and S. Shaw. 1999. New, native species of Peristenus (Hymenoptera: Braconidae) parasitizing Lygus hesperus (Heteroptera: Miridae) in Idaho: biology, importance, and description. Annals of the Entomological Society of America, 92: 370-375. Kelton, L. A. 1975. The lygus bugs (genus Lygus Hahn) of North America (Heteroptera: Miridae). Mem. Entomological Society of Canada. 95. Scott, D. R. 1987. Biological control of lygus bugs on vegetable and fruit crops, pp. 40-47. In Economic importance and biological control of Lygus and Adelphocorus in North America, R.C. Hedlund and H. M. Graham. U. S. Department of Agriculture, Agricultural Research Service 64. National Technical Bulletin 15: 159-169. UC IPM. 2002. UC Pest Management Guidelines: Peach Plant Bugs. 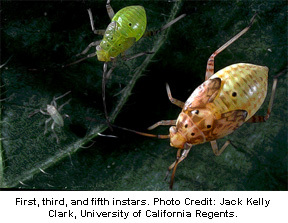 University of California Statewide Integrated Pest Management Program. http://www.ipm.ucdavis.edu/PMG/r602300511.html. Xhu, K.Y. and W.A. Brindley. 1992. Significance of carboxylesterases and insensitive acetylcholinesterase in conferring organophosphate resistance in Lygus hesperus populations. Pesticide biochemistry and physiology. 43, no. 3 (July): p. 223-231. In the event that we are not yet acquainted, let me take a moment of your time to introduce myself. I am the Queen Bee of Labels (that’s “QBL” to those in the know). Actually, I am presently the Queen Bee ELECT, as I am waiting for the U.S. Environmental Protection Agency (EPA) to make my appointment official (See "If I Were the Queen of Labels," AENews May 2000, Issue 169). Because I haven’t yet heard from EPA regarding my Royal Appointment as the QBL, I have had some time on the Royal Hands, which I have been using to prepare for my pending coronation. You simply can’t imagine the planning that is required for such an event! It is enough to dampen the Royal Exuberance. (I hesitate to admit this to my public but I think all this organizing, coordinating, and list making has made me just a touch cranky - at least that's what others at the palace report!) Thus, when party planning takes its toll, I temporarily set aside my copious notes and lists and once again take quill in hand to bring some sanity to the matter of pesticide labels. But before I begin this month’s dissertation, I want to emphasize that if EPA would simply step up to the plate, as it were (yes the QBL does now and again sink so low as to enjoy a good baseball game and root-root-rooting for the home team), and hasten that appointment, the QBL could focus the Royal Attention on some SERIOUS party planning. That might be in everyone's best interest. After all, if you are a responsible registrant or an earnest EPA-er, you may receive an invitation to the coronation. The item that most recently caught the Royal Eye is dimethoate. As some may know, EPA is in the process of reregistering this chemical. In fact, Washington State University (a quaint little land-grant institution where I have been known to spend time in between Royal Duties) has just finished collecting information and supplying it to EPA regarding the use of this chemical in the Pacific Northwest. I, for one, am delighted to hear that EPA is taking a good hard look at dimethoate. It would appear to those in the know about pesticide labels (yes, moi) that it is about time someone looked at dimethoate labeling. Now I know you may be wondering if the Royal Brain has malfunctioned and perhaps it’s time for a new Monarch. Having visions of succession? It really isn’t nice to doubt the QBL. Shame on you. For those Doubting Thomases among you, I have one question: have you looked at any dimethoate labels recently? I think a quick scan of some Dimethoate 2.67 labels will do the trick. For the uninitiated, the 2-6-7 refers to product formulated to contain 2.67 pounds of dimethoate per gallon product. In Washington, there are three labels for this formulation registered (not counting one supplemental and four Special Local Needs or SLNs). When I started a review of these labels the Royal Blood Pressure began to rise. What have registrants been doing over these past few years? Haven’t they been listening? Is anyone following the Royal Rules? It’s enough to make one pull out a regal silver hair or two. The three aforementioned dimethoate products currently registered in Washington are MicroFlo's Dimethoate 267 (EPA # 51036-198), Gowan's Dimethoate E267 (EPA # 10163-56), and Drexel's Dimethoate 2.67 (EPA # 19713-232). From here on out feel free to think of these as the Terrible Trio; I do and find it fitting. For starters, let’s examine the use directions for cherries on each of these labels. MicroFlo's label (directions given for both pre-harvest and post-harvest uses) states that it is for use only on cherries grown in Idaho, Oregon, Utah, Washington, and Montana. Use is limited to a single application each for pre- and post-harvest and the PHI is 21 days. Drexel's Dimethoate 2.67 label is another story altogether. Cherries are nowhere to be found on this label. Those of us who will simply not let dozing dogs lie must resort to Washington Special Local Needs (SLN) registration WA-970005. This allows for the use of Drexel's product both pre- and post-harvest. The post-harvest use is limited to a single application; however the pre-harvest use allows for the use of up to 3 pints per acre or potentially two applications. The PHI for this label is 28 days. Interestingly, for the post-harvest use, no application rate is given. Let’s just take a minute to summarize the options for Washington cherry growers. In Washington, a grower may choose between the MicroFlo product and the Drexel product under SLN WA-970005. Washington growers may not use the Gowan product on cherries. If a Washington grower should elect to use MicroFlo’s product it appears that he or she may make two applications; one each pre-and post harvest. Use of the Drexel product under the SLN would allow an additional pre-harvest application, but the total product used pre-harvest is limited to no more than 3 pints per acre. This is less than the 6 pints allowed on the MicroFlo label. The SLN also apparently allows for the use of an unlimited amount of the product for the single post-harvest application. For pre-harvest uses, again beware. The PHIs differ between the Drexel SLN and the MicroFlo label. First, one wonders how an SLN label could have been issued that has no application rate given for one of its uses. What happened here? Drexel, this is VERY sloppy. Please, let’s not require users to infer or assume, especially when it comes to applications rates. Just give the growers, up front, the information that they need to make responsible pesticide applications. Second, how can three products with basically the same application rates carry differing pre-harvest intervals? I posed my query directly to MicroFlo. According to the Product Manager for dimethoate, the disgraceful discrepancies with the PHIs are because EPA did not catch this during their first review of the label. It appears that MicroFlo had the error on the label it originally submitted to EPA. I was assured several times that MicroFlo's label was “EPA-approved.” MicroFlo, that is not the point. What if some hapless farmer in Idaho, Oregon, Utah, Washington, or Montana used this product on cherries prior to harvest, then harvested the fruit in 21 days? Imagine his or her position should the fruit be found to contain dimethoate residues above the tolerance. The crop would be unmarketable and would need to be destroyed. Not to mention the black mark on your name at the processing plants. Do you think that the QBL is going to smile down upon MicroFlo simply because they have in hand a label approved by EPA? Not on her Imperial Life. One wonders, now that MicroFlo has been made aware of the discrepancy, will they issue a revised label or will they simply wait and not make the change until EPA forces them to? I suspect the latter and I don't think it's sporting. The Dimethoate 267 Product Manager at MicroFlo should not be holding his breath awaiting an invite to the coronation and neither should the EPA-er responsible for the original label review. The CURRENT reviewer, on the other hand, might have a chance to make the invitation list. Consider it your incentive for a job well done. I’ll be watching. Before I leave the cherry section of this dimethoate dissertation, and lest all this alarm you, let me say that, omnipotent personage that I am, I do know that dimethoate is critical in cherry production for the control of cherry fruit fly. In Washington State, cherry fruit fly is a quarantine issue and the control of these beasts is crucial to the state's sweet cherry production. My Loyal Followers should know that the discerning Palatial Palate favors sweet cherries and I would never want to cast aspersions on the sweet cherry producers. The TRUTH is that approximately 50% of Washington cherry growers make one post-harvest application of dimethoate at 1 to 1.25 lbs. of active ingredient per acre per year. This translates to use of approximately 4 pints of Dimethoate 2.67. This is far less than the 6 pints allowed by the MicroFlo label and much less than the as yet unspecified (unlimited?!?) amount on the Drexel SLN. While the labels may be lax and registrant efforts found wanting, rest assured that despite these potential pitfalls the growers are doing the right thing. If all this cherry business isn't enough to convince you that a good review of dimethoate labeling is in order, then take a look at the use directions on the Terrible Trio for beans, broccoli, and cauliflower. For these crops there are neither restrictions nor guidance on the number of applications that can be made each year. I did inquire about this with respect to another issue and was told that this was a reflection of the age of the chemical: this information was not required when these older products were first registered. Is that any reason for the registrants to have not added this useful information to the labels at some point when the labels were going through revision? After all, there are tolerances for each of these uses and the residue studies that supply the data to support the tolerances are based on a specific number of applications. So, where is the information? Inquiring Royal Minds want to know. Imagine the trusty farmer who is using dimethoate on his broccoli and who makes so many applications that residues on his crop exceed the dimethoate tolerance. If you think, even for a minute, that the QBL isn’t going to hold EPA and the registrants equally responsible for this you are sadly mistaken. Even if EPA did not originally ask for this to be included on the label, any responsible registrant would have made sure it was there. I am almost ready to leave dimethoate 2.67 but I have one more tiny leaf to shred with regard to cabbage. Drexel and Gowan each state the PHI for cabbage is 7 days while the MicroFlo label carries a 3-day PHI. What does MicroFlo know about dimethoate that others do not? Can it really be appropriate that the same chemical, same formulation, applied at the same rate carries two different PHIs? Is there something about the MicroFlo product that makes it such that it is not retained on or in the plants as long as the Drexel and Gowan product? Nothing, no, and no. MicroFlo’s representative stated that he thought this error had been caught by EPA and was in the process of being fixed. Excuse me, but shouldn't MicroFlo be catching the problems with their own label? Jane M. Thomas (a.k.a. HRH QBL) is the Pesticide Notification Network (PNN) Coordinator (http://www.pnn.wsu.edu/) and the Comment Coordinator for the Pacific Northwest states within the Western Region Pest Management Center (http://www.wrpmc.ucdavis.edu/index.html). When she’s not dispensing Royal Wisdom, she can be reached at Washington State University’s Tri-Cities campus at (509) 372-7493 or jmthomas@tricity.wsu.edu. Over the past three and a half years, I have told the story of the Pacific Northwest’s fledgling lingonberry industry here in the pages of Agrichemical and Environmental News (AENews). 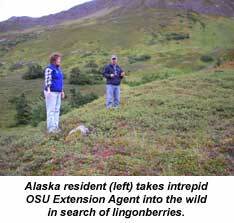 In “Stalking the Wild (and Not-So-Wild) Lingonberry” AENews Issue No. 165, Jan. 2000), I profiled this humble berry, tracing its European roots and describing efforts to grow it commercially in the United States and Canada. In “The Wide World of Lingonberries” (AENews Issue No. 190, Feb. 2002), I traveled to the lingonberry’s ancestral homeland, visiting Germany, Sweden, Finland, and Estonia, where I sought information on commercial lingonberry production and on markets for the fruit. Through my field work at home and away (including a 2002 trip to Alaska, described later in this article), I have learned that the Pacific Northwest (Washington, Oregon, and British Columbia) leads the world in commercial production of lingonberries and is a major player in research on this fruit. The berries grow wild in northern Europe, Asia, and North America, but cultivation is spotty at best. This article describes the state of the industry and the progress we have made since the 2002 article. For those unfamiliar with the lingonberry, it is a small, red fruit borne on low-growing, woody evergreen shrubs. It is also known as cowberry, partridge berry, mountain cranberry, rock cranberry, dry-ground cranberry, lingen, lingberry, fox berry, and red berry, among other monikers. The name “lingonberry” originated in Sweden and is used in Canada and the United States. In Newfoundland it is called partridge berry, while the Scandinavian market prefers the name cowberry. For the sake of discussion, we can separate the lingonberry into two classifications, the wild (Vaccinium vitis-idaea Minus) and the European domestic (Vaccinium vitis-idaea). The wild, “Minus” lingonberry is found across the northern hemisphere in forested areas that experience cold winters and warm summers. The plant is quite short, just 3 to 6 inches tall, and produces fruit on a single bloom. Domestic lingonberries are plants that have been crossbred for production characteristics. Breeding has taken place primarily in Europe. They can grow 8 to 16 inches in height, have two blooming periods, and produce more fruit than the wild variety. 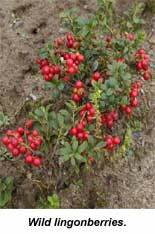 Most of the lingonberries consumed worldwide are the wild-picked, Minus varieties. Wild lingonberries can be found in Canada, Scandinavia, Poland, China, and Russia, and approximately twenty other northern countries. 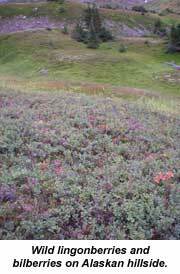 In August 2002, after presenting a paper on lingonberries at the International Society of Horticulture Science conference in Toronto, Canada, I headed north to Alaska. The 49th state is a rich berry-growing region; over 115 wild berry varieties grow there, from wild strawberry to salmonberry, from bunchberry to bearberry. And, of course, lingonberry. In Anchorage, I saw wild lingonberries in the botanical garden and represented in the dioramas at the Alaskan Culture and Heritage Center. Outside of town, I spotted them near the tiny village of Hope (where local residents compete with grizzly bears for a portion of the harvest), along backroads off Highways 1, 2, 3, and 4 between Anchorage and Fairbanks, and in Denali National Park, growing both in forested settings and out on the tundra. Reminiscent of my lingonberry-hunting visit to Europe, I found only two small commercial growers in Alaska. So, who buys lingonberries, and what do they do with them? In Alaska, as in Scandinavia and other parts of Europe where consumption is high, lingonberries are used for jam, jelly, juice, wine, liqueur, candy, and as a baking ingredient in cakes, scones, and the like. They are flavorful, lending themselves to concentrate, and colorful, making them potentially useful as pigment for food coloring. Because they are high in vitamins A and C as well as magnesium and flavonoids, they are considered healthful, even medicinal. Europeans consume over 180 million pounds of lingonberries annually, and consumption is also strong in Asia. Since most of this demand is met by wild lingonberries, which, with their low growth habit, are difficult to harvest, it would seem that the lingonberry consumers of the world would be “ripe” for a commercial source. The other potential market for the berry is consumers who are as yet unfamiliar with the fruit, but would likely appreciate its taste and health benefits. While I cannot yet vouch for the state of commercial lingonberry production in Poland, Russia, or the Far East, my research to date indicates that only Germany, Canada, and the United States cultivate lingonberries today. Washington, Oregon, and British Columbia appear to lead the world in this endeavor. Commercial lingonberry production in the Pacific Northwest began in the mid-1990s. By the time I wrote my AENews article in January 2000, the main concerns in “growing” the industry were how to produce the berries without pesticides (as such a minor-minor crop would be unlikely to receive much registration attention from chemical manufacturers), how to work with the double bloom of the domestic lingonberry, how to harvest the berries, and how to market the berries. As it turns out, the Pacific Northwest lingonberry industry uses almost no pesticides. The fruit has virtually no insect problems and very few disease pressures. Weed control is the most important pest issue, and is accomplished largely through cultural measures beginning with site preparation and maintenance and including good mulching. We have experimented with herbicides in research plots, but production fields have achieved good results by relying on hand weeding, some mechanical cultivation (performed with care, as lingonberry roots form near the soil surface), and, in some cases, establishment of a grass sod between the rows. In terms of insects, the Western spotted cucumber beetle (Diabrotica undecimpunctata), Western striped cucumber beetle (Acalymma trivittatum), and the obliquebanded leafroller (Choristoneura rosaceana) have been found in Washington and Oregon lingonberry fields, but their feeding has been minor, resulting in no economic damage. Disease pests are similar to insects in that they exist in Pacific Northwest lingonberries but are managed, for the most part, without use of pesticides. Growers practice good sanitation, choose healthy plants from proven cultivars, and maintain soil health and texture to minimize disease. We have found that adding high amounts of organic matter to the soil increases its permeability and may reduce the number of pathogenic species in the soil due to competition from other soil organisms. Diseases that have been found in the Northwest include leaf spots and twig blights associated with a variety of fungal pathogens, black rot from Allantophomopsis lycopodina, ripe rot from Coleophoma empetri, damping-off from various Rhizoctonia spp., and root rot from Phytophthora citricola. Most of these seem to affect a limited number of cultivars and have not resulted in economic damage. There has been one notable exception. In 2000, we began seeing a problem in some Oregon plantings: the plants had a sunburned appearance and some of the berries were falling off prematurely. When the Oregon State University (OSU) Plant Clinic failed to make positive identification, the USDA Agricultural Research Service laboratory in Beltsville, Maryland became involved. It appears we have discovered a brand-new fungal pathogenic species, Phomopsis columnaris. The disease causes progressive twig dieback and eventually results in the whole plant dying. It appears to affect only one cultivar; more research is underway. The domestic lingonberry cultivated for production has two blooming periods, March to April and July to August, with fruit ripening in mid-August and early November, respectively. Twenty-one double-bloom cultivars have been planted in the Pacific Northwest and several are showing great promise. While the few commercial fields in Europe (Germany, Sweden) yield 1 to 6 tons of fruit per acre, we have experienced yields of 4 to 21 tons per acre on research plots in the Pacific Northwest. At present, all commercial lingonberries are hand harvested with berry rakes similar to those used for lowbush blueberries or dryland cranberries. We have located four harvesting machines for consideration, but have not yet investigated modification of the machines nor set trial dates. Three were designed for other fruits (a dryland cranberry picker from Minnesota, a wild blueberry picker from Nova Scotia, and a lowbush blueberry picker from Maine), but might be adapted for lingonberries. A fourth machine was developed in Germany specifically for lingonberries, but it is very large and bulky. Further investigation into these and other options is necessary to determine the feasibility of mechanical harvesting. We touched on this issue earlier. A market exists for lingonberries. In fact, demand exceeds supply. Beyond the many food uses, the berry shows promise for medicinal and pigmentation (food coloring) applications. There are now 23.5 productive acres of lingonberries in Washington, Oregon, and British Columbia; the largest single grower has fewer than three acres. In the near-term future, I see lingonberries remaining a small farm/niche market crop, but as the berry gains recognition, larger acreage will follow. To date, efforts have been focused on choosing the most promising cultivars, improving fruit quality, and increasing per-acre yield. Having succeeded in those areas, acreage will be expanded in the future to accommodate demand for fresh and processing markets. The Pacific Northwest lingonberry industry is still in its infancy, but important strides are being made. A Grower’s Guide is undergoing internal review at OSU as of this writing and will soon be available. A Website with resources for the lingonberry grower and general public is under development. A conference scheduled for 2002 was canceled, but the one we held in 2003 drew attendees from as far away as Newfoundland. Forty individuals attended and shared lingonberry insight, information, and (best of all) edibles. By pooling our information resources and expanding on our successes to date, the Pacific Northwest can become an important supplier for world lingonberry demand. Ross Penhallegon is with Oregon State University’s Lane County Extension Service in Eugene. He can be reached at (541) 682-4243 or ross.penhallegon@oregonstate.edu. The Washington State Department of Health (DOH) announced on September 3, 2003, that a previously confirmed human case of West Nile Virus (WNV) has been disproved. Follow-up testing by the DOH laboratory and negative test results from the Centers for Disease Control and Prevention (CDC) showed that the Yakima County man did not have West Nile virus (WNV) infection. The case had been listed as "probable" pending confirmation and has now been de-listed. The Yakima man, in his 30s, had been hospitalized when he first became ill in early August and is recovering. In its August 29 West Nile Virus Newsletter, DOH reported that Washington surveillance activity has included testing of 661 birds from 35 counties, speciation of over 900 mosquito pools from 27 counties, and testing of 46 horses from 20 counties. Also, 191 mosquito pools and 395 blood samples from sentinel chicken flocks have been tested by the Benton County Mosquito Control District. There have been no positive surveillance findings to date. The conference includes a trade show, and sign-ups for booths have begun. Visit the Website for details. The 2004 National Monitoring Conference, "Building and Sustaining Successful Monitoring Programs," is slated for May 17-20 in Chattanooga, Tennessee. Join us as we explore and share the experiences, expertise, lessons learned, innovations, and strategies that strengthen and sustain both the technical and institutional elements of our monitoring programs. The Chattanooga meeting will be the fourth National Monitoring Conference hosted by the National Water Quality Monitoring Council (NWQMC). Like its predecessors, the 2004 Conference will provide an outstanding opportunity to participate in technical programs and trainings, share successes, discuss issues, and network with our colleagues in the water monitoring community. The conference agenda will include plenary sessions, workshops, paper presentations, posters, exhibits, facilitated discussions, field trips, and informal networking opportunities. NWQMC and the Framework for Monitoring the Council, chartered in 1997, promotes partnerships to foster collaboration, advance the science, and improve management within all elements of the water monitoring community, as well as to heighten public awareness, public involvement, and stewardship of our water resources. The Council has developed a monitoring and assessment framework that describes a sequence of steps that produce and convey the information necessary to understand our water resources. This conference will weave together several themes related to the framework including changing expectations of monitoring, new and emerging technologies, collaborative efforts, data and information comparability, and sharing results and successes. The 4th Annual National Pesticide Stewardship Alliance (NPSA) Conference is scheduled for October 19 through 22, 2003, in Tucson, Arizona. This year's theme is Stewardship Issues: Discussions for a Global Community. Focus topics will include the future of state pesticide disposal programs, residential pesticide stewardship, and label language pertaining to container disposal. The XI International IUPAC Symposium on Mycotoxins and Phycotoxins will be held in Bethesda, Maryland, from the 17th to the 21st of May, 2004. The International Union of Pure and Applied Chemistry (IUPAC) Food Chemistry Commission initiated the series of International Symposia on Mycotoxins and Phycotoxins and the first was held in Kungalv, Sweden in 1973. Since then nine symposia have been held in Pulawy, Poland; Paris, France; Lausanne, Switzerland; Vienna, Austria; Pretoria, South Africa; Tokyo, Japan; Mexico City, Mexico; Rome, Italy and Guaruja, Brazil. The symposia have become the principal international interdisciplinary meeting on mycotoxins and phycotoxins. The most recent, held in Brazil (May 2000), focused on the global significance of mycotoxins and phycotoxins, their occurrence, assay proficiency, toxicology and risk assessment. The XI symposium will assess progress or advances made since Brazil 2000 in relation to overall goals of the series and the evolving global perspective of food safety. Internationally renowned guest scientists will highlight: advances in methodology; the value of risk assessment and its regulatory use; laboratory quality assurance and quality control, accreditation and method validation, particularly in developing countries. Advances in genomics for detection and evaluating the impact of mycotoxins and phycotoxins on human and animal health, as well as control strategies will be discussed. In addition, an estimated 200 posters will be presented. There will also be a “self assessment” of the IUPAC Symposia on Mycotoxins and Phycotoxins series from a historical and impact perspective. The symposium is of prime importance to educators and researchers worldwide. The Organizing and Scientific committees invite submission of abstracts for oral or poster presentation on cutting edge research in the topics listed below. T11- GMOs, nanoscience and nanotechnologies. Abstracts are due by October 6, 2003, and must adhere to the following format. 1. 300 words or less, single-spaced, 12 font size and in English. 2. The title must be in CAPITAL letters. 5. The title must be as brief as possible, but sufficient to indicate clearly the nature of the study and category. 6. Electronic (e-mail) submission is preferred (hnjapau@cfsan.fda.gov; strujill@cfsan.fda.gov; dpark@cfsan.fda.gov) but abstracts may also be faxed to 301 436 2644 (attn: IUPAC SYMPOSIUM) or PC floppies (MS word) mailed to the IUPAC XI Symposium on Mycotoxins and Phycotoxins Secretariat (Symposium Secretariat).